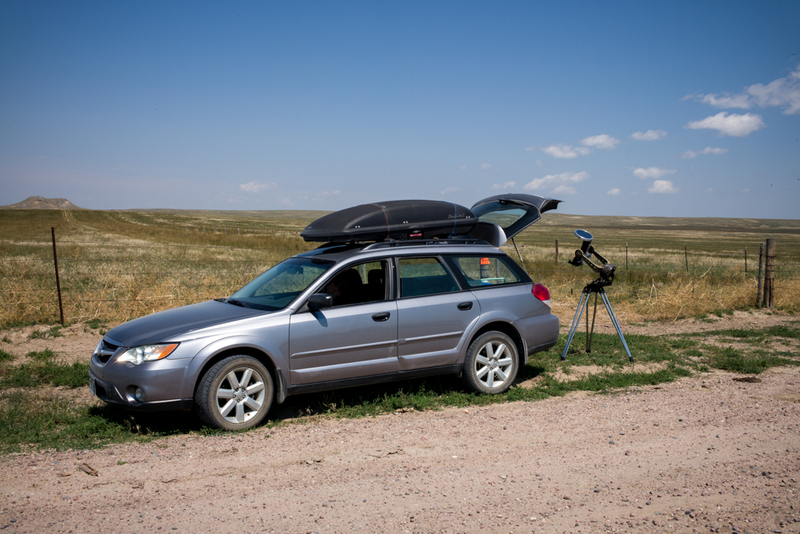 I arrived at my observation site a few minutes before totality. The site is on the north side of a very straight road leading from Wyoming state highway 159. The straight road intersects WSH 159 east of Tea Kettle Rock, and I was along the road some two miles east of the highway. The site's GPS coordinates are 42° 13.990' north latitude and 104° 08.850' west longitude and the altitude is 4475 feet above MSL. The site is on a wide, flat plain with a few buttes running in a shallow arc from Tea Kettle Rock on the west around to the north and ending nearly due east at a distance of about one mile. There is a ranch house about a mile to the north-east across the flat plain. The weather at my site was perfect except for wind. The sky was completely clear, but there was a gusty wind which raised a trace of dust into the atmosphere but which created no problem. Strangely, to me, the wind died completely during totality and then resumed slowly throughout the following hour.